On Sunday, April 28th at 2 p.m., come Meet the Web Feet at the Amboy 4-H Environmental Education Center. The spring skies and water echo with noise and activity as ducks, geese, and other waterfowl return to their natal ponds to court and raise young. Following a slide presentation on ducks and other water-bird residents of the Center’s pond and brook, participants will enjoy a walk to the beaver pond with naturalist Pat Carney, to look and listen for waterfowl. Perhaps they will see Hooded Mergansers courting or hear an American Bittern calling. Dress for an early spring outing. Binoculars recommended. While the Center does have a few pairs of binoculars to borrow, everyone is encouraged to bring their own. The program fee is only $4.00 fee per person, or $12.00 per family, and children under the age of 3 are free. The Amboy 4-H Environmental Education Center is located at 748 State Route 183 in eastern Oswego County, between Routes 13 and 69 near Williamstown. 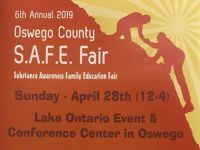 For information about the facility and its programming, call the Cornell Cooperative Extension of Oswego County 4-H Office Monday through Friday at 315-963-7286. To find out about programming at the Amboy 4-H Environmental Education Center before it hits the newspaper, find us on Facebook at http://tiny.cc/AmboyOnFB. Cornell Cooperative Extension is an employer and educator recognized for valuing AA/EEO, Protected Veterans, and Individuals with Disabilities, and provides equal program and employment opportunities. Please contact the Cornell Cooperative Extension of Oswego County office if you have any special needs.